This late season flowering clematis vine shines with huge 4 to 6 inch magenta red perennial flowers sporadically June to July and then in full force August to October. 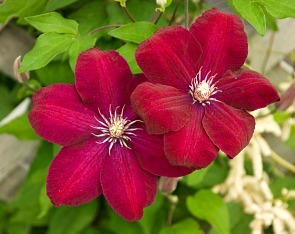 Rouge Cardinal Clematis is an easy to grow vine for trellises, arbors, over terraced walls, stumps and trees. The dense foliage and flowers are perfect for trellises along side patios and decks for seasonal privacy. While the plant itself can grow in full sun to light shade, the base and root system should be planted in shade. Mulch heavily to keep soil moist. Clematis need to be planted 3 inches deeper than the original pot. 'Plant' the first set of leaves to encourage the production of strong shoots from below the soil level and to discourage clematis wilt. Thank you to Walters Gardens for these wonderful tips. How to Prune Clematis video. Rouge Cardinal Clematis is grown in a quart size pot. Orders shipping to AZ and CA addresses will be bare rooted before being prepped for shipping.